LITTLE ROCK -- That firewood you’re planning to take on your next camping trip could turn out to be luxury mass transit for the next big invasive insect and tree disease, said Tamara Walkingstick, associate director of the Arkansas Forest Resource Center. The U.S. Department of Agriculture estimates the Formosan termite causes $1 billion in damage every year. 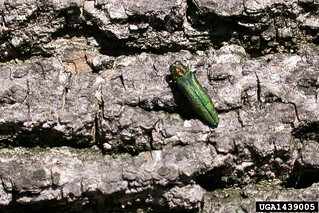 Another pest that uses wood to hitchhike is the emerald ash borer. This tiny, green metallic insect was first found in North America in 2002 and may have been here since the 1990s. Hitchhiking insects are also implicated in the spread of Thousand Cankers Disease that threatens the black walnuts of the eastern half of the U.S.
Ash trees make up a good percentage of river bottom forests in eastern Arkansas, and the insect appears poised on the state’s northern border with Missouri. Even if your firewood doesn’t have holes, burrows sawdust or other abnormalities, don’t move it. Even if the plan is to burn all of the wood, “It’s still possible that a fallen flake of bark or an egg or spore could drop off in the woods or on your vehicle before the first match is struck, the hitchhiker still has a chance to set up home in a new location,” she said. While many are familiar with quarantines imposed due to red imported fire ant infestation, many might be surprised to learn that there are firewood restrictions. A map of states with firewood movement restrictions may be found here: www.dontmovefirewood.org/the-problem/state-state-information/index.html. “If you see a suspected invasive, report it to your county extension office or the state plant board,” Walkingstick said. To learn more about the campaign to keep log-based forestry pests from spreading, see www.dontmovefirewood.org/. For more information about invasive species in Arkansas, visit http://www.arinvasives.org/, our newly revamped site at www.uaex.edu, or contact your county extension office.